Follow @mcphoo Tweet A week or so ago i posted about my initial experience of trying Kenneth Jay's high reps lower weight / higher weight lower reps work. The report covered my first effort with high volume. 9 sets of 5 at 12kg, followed by 8 sets of 5 with 8's in the first 15 min zone. Then 20 sets of 5 with all 8's in the second 15 minutes. Breaks were used with bodyweight deadlifts focusing on bone rythmn, form and breathing. Since then, i did a heavy day, which for me is with a 16. A bit of background: for me, getting a 16 press on my left side has felt pretty hit or miss. The stars have to be aligned or something. I was therefore keen to see if the reps of grooving in the form were going to have an impact. The answer seems to be "yes." The C&P on the left? solid. wow. That thing just went up. wow. The stars are aligned, right? So then the 2.5-3min break for full recovery (more on recovery times for different kinds of strength here). I did a C&P on the right, starting with the strong side first (here's why). And, amazing! that sucker went up on the left side again - no hip, just solid up. I got it up on the right again, the left side stuck half way so it got an assist. Recovery, again right side went up (rep 4) and the left side again hit the sticking point, so got an assist. Then did a set of partials with the 20 on both sides. Breathing right here - inhale on the press; exhale slightly on the down; inhale on the extension. up and down as KJ says each time trying to get a little lower and back up. Works. Since this mayn't be entirely the easiest way to derive the routine, and since i've had a few questions, if you're interested on exactly what i've done, please see this new post on the protocol. The first obvious benefit of volume is that i got a 50% improvement on the left side. Now, i'm pretty durn sure i'm not 50% stronger on the left than i have been. What seemed to be happening is that the form was far more locked in. And so the form was applied to the heavier weight. Additionally, one of my foci on doing the reps on the high volume day was to focus on breathing, especially on the bell going up - inhale up, exhale bringing it down. Doing that breathing pattern really seemed to make the left side (the weaker side) come into form. Biggest difference: the left press was WAY more relaxed. second 15 min zone: 2 more sets of 5 at 12's followed by 13 sets of 5 with 8's. The rest between sets was exactly the same as the previous day (10 bw dl's) so it seems the sets themselves were somewhat longer. That said, total Volume is up: (13*5*12)+((2*5*12)+(13*5*8))= 1420. A little under 10% improvement in one week. What's going on here? The biggie is the total sets with the 12 goes up from 9 to 15. 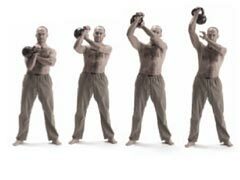 Now this, too, could be adaptation as opposed to real strength increases, but still, the benefit of a single cycle of effort, whether based on neuro-muscular adaptation or on strength or both is not to be dismissed. That's progress. I'll take it. Well Joy and Amazement, here's the pay off, if there was any doubt. How many C&P's with the 16? SIX. that's right: from 2 to 6 on both sides. That's a three fold improvement on just the session before. To be clear that's 6 C&P singles rather than 2 singles. How do i know it was only 6? I lost it on the 7th and 8th attempts on the left side - finishing with an assist each time. That was not deliberate. I could not tell from the previous efforts that the left side was going to fail. So i need to learn to listen to that. Action during Recovery on Heavy Day: i should also note that i did various z health drills during the recovery phase between these singles, mainly, but not exclusively, shoulder drills. Did that contribute to the gains as well? A recent study on integrated cardio (discussed here) seemed to suggest that ROM work (like z) does contribute to strength gains. It's something i'll continue to do when i have a 2-3 min recovery pause on a heavy day. Form form form. The big, and i mean BIG difference for me in these C&P's was that they felt smooth. Like they were just gonna GO UP. The left side was not as fast going up as the right side - the sticking point echo was there in the 3rd-6th reps, but i could just tell that i could press through them solidly, stable upper body, no hip coming into it. Also, with the breathing and form, the move became far more of a clean - exhaling into the rack - and then the press, inhaling into the up, lock, exhaling down into the rack. I hadn't been so aware previously of the rack at the end of the clean, and especially the value of that exhale into the rack. Relaxed. I know, in HardStyle we talk about tension, and getting all tight and locked, but we also talk about the balance of relaxation/tension. And perhaps that's what was kind of happening here for me: a better balance of tension and relaxation. When gals doing GS events are ripping off TONS of C&P's with the 16 (inspiring, eh? ), my few 6 singles may seem pretty frickin' tame, but, i console myself: i'm not doing GS at this time; my focus is on getting stronger presses. The 16 is a start. This report is just ONE complete cycle really of the high/low approach. My approach will be to see how the adaptation/strength curve progresses: will there be more sets of 12, till i get 2 full zones (2 full 15 min periods) of complete 12's; what will the carry over to the heavy presses be? More 16's? how long till finally pressing the 20? will the 24 come into sight, which is the end game here. I don't expect each week to give these kinds of % increases, but am keen to see how the curve unfolds. It's too soon to make any real summative statements about the effects of high/low volume on my strength - the gains i've had so far seem like adaptation more than raw strength - they're just too big. But so what? The way these moves *feel* is so much better that if i got no other benefit than closer to the Perfect Rep, that would be worth the price of admission. But the payoff seems to be that this protocol, as promised by its author, is also pushing well into strength. Thanks again to Al for pointing me to it. Great going MC. I am sure you would achieve your goals pretty soon. Tho' I am not too sure, all this emphasis on vertical pressing is good for you. I am speaking from experience as I have high mileage shoulders, knees and low back. I have gotten to a point that I cannot do any pullups, or any vertical pressing because of calcific tendinosis. I do believe the supraspinatus has only so many vertical movements in it. Kamal, thanks for the vote of support. Agreed overdoing something is overdoing something. Repetition can be really problematic - especially if the emphasis on a joint is in one direction only. The eccentric or negative part of the repetition is when the rotator cuff accepts most force. If you do not slow the weight down with larger muscles, slowly, you put the rotator cuff at risk for tears and rotator cuff impingement syndrome. The general point of this entire discussion is to always lower the weights under complete control. Even if you lower the weights properly poor exercise selection can still cause rotator cuff problems. If your shoulders are sore or tender never perform any exercises which aggravate them. It is always a good idea to avoid chest and any other exercises which involve shoulders after your shoulder workout for a couple days"
I hope that might help a bit. Also, as i understand it, a lot of joint repetitive strain issues come from, too: it's often flexion or extension rather than a balance of both. Hence not only focusing on form of extension/flexion, but doing the shoulder mobility drills in between sets on the heavy days, and general z mobility daily. thanks again for dropping by, and i shall remember to heed your caution. good one.